okay. plugging done. back to the wall. i'd been itching to make a champloo wall ever since i first saw their scans. and finally i've done it. this wall was really a make-it-up-as-i-go along one. i found this scan from the gallery at animeforum [took me a long time to patch up the two pages] and i started adding elements i found in other scans. what i love about samcham is how it encorporates all the traditional japanese things and yet creates such a funky look. i think i've used at 8 scans to put this together, so if you look close enough you'll find all sorts of weird and wonderful details. took me a crazily long time to finish, and i'm really proud of it. XD feel free to critique [or praise :x] it. u won a fav dude..
WOAH! awesome! I love Samurai Champloo ^___^ +fav! I like how the background go so well with the scan. The traditional scan and those colour do good with title related to samurai. Hm hmm.. Ya, the background complements the style of art of the character images very well. Well done. Of all of the Samurai Champloo scans, the one used in this one is by far my favorite, and I've been waiting for a wallpaper that features it in a clever way, and kakitsubata has delivered! I really love the tiny little touches that escape initial observation, and I love all of the effects used. If I had to be nitpicky, I would say that the one thing I am not entirely thrilled about is the fact that the pine branches/needles in the background are crisper than the foreground scan. 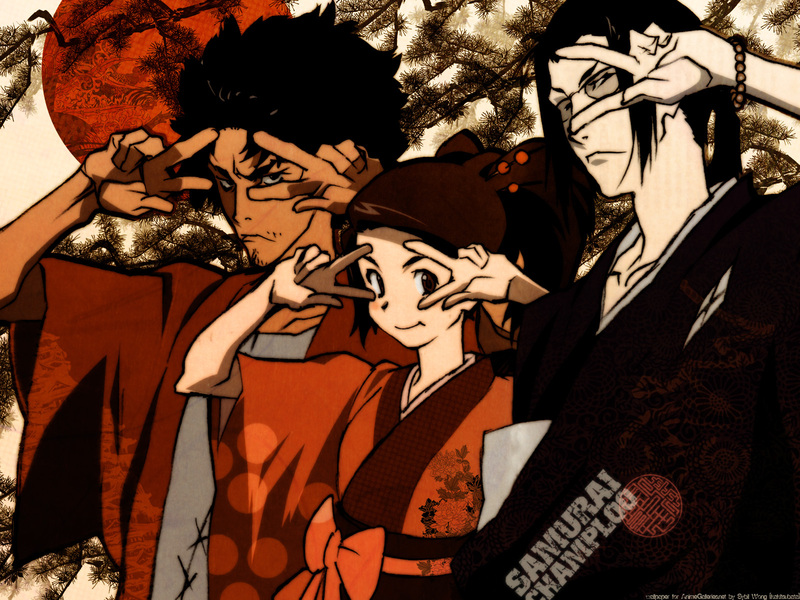 While I like them a lot, their sharpness draws attention to them away from Jin, Fuu, and Mugen, while it should be the Champloo Trio who are front and center in terms of attention. Regardless, awesome work. Keep it up! hehe this is a really cute wallpaper of them.. =D nice job too! lol. this is nice. I love these three. samurai Champloo Batusi, Like Mr. Burns: Excelent! it's Pulp fiction you're tjhinking of. ^_^. This wp caught my eye cuz it stands out from the others. they're not posing and being all samurai like. They're doing the watussi or something which is definitely not samura- like. Nice wallpaper. Everything blends in very nively.